this thing we all do . . .
Mr. Turrell’s recent quip brings to the forefront a distinct feature of representing or documenting one’s artwork. Does it really look like the image being included with a call for entries, posted at an online marketplace, or shared on a social network? Of course, the photographing of artwork to enhance its appeal did not begin with digital devices or the World Wide Web. Most of us are familiar with the curator’s disclaimer that reserves their right to reject artwork which arrives substantially different than visually represented when proposed. Even non-artists know how easy it is to boost the contrast or color saturation of a digital image. 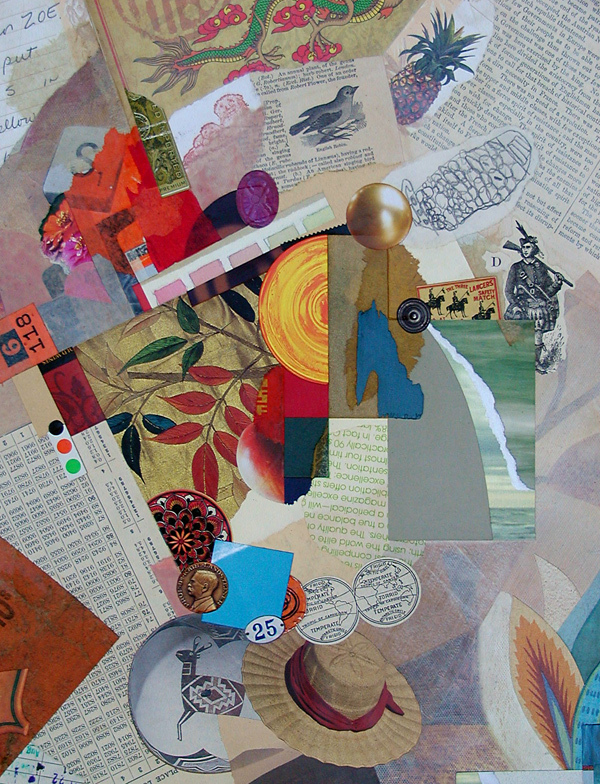 Setting apart from our discussion works that are essentially digital from the outset, it is important for anyone working in the medium of traditional collage to squarely meet this challenge: How do we properly interpret the visual experience of seeing our artwork firsthand? Needless to say, faithfully photographing or scanning conventional artwork is something that professionals face every day, but how can it ever be an exact science? What is the “true” appearance of anything? As the three examples below demonstrate, one of my recent collage artworks photographed differently under three different lighting conditions, before it was delivered. The more neutral version is closer to how it might “typically” appear, but perhaps the most faithful rendition would be an image made in the setting for which the piece was commissioned, under the unique lighting conditions of that particular environment, and then subsequently balanced for a reasonable match to the naked eye. All that any of us can do is establish a level of integrity about representing work to others. For those who routinely cheat or push an ethical boundary? Rest assured; the habit will eventually come back to haunt their studios. 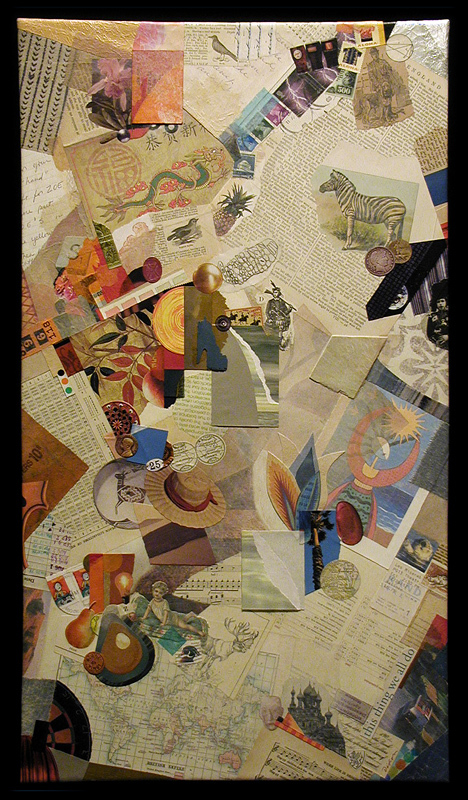 And now, a few words about today’s collage example. I must first express my appreciation to Lee and David Simpson for the commission that resulted in this thing we all do, a mixed media and collage artwork on canvas. 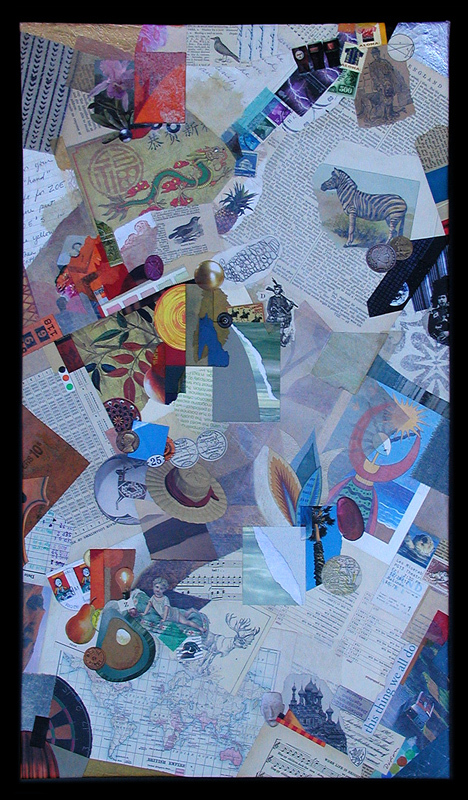 To infuse the composition with images that represent aspects of significance to their lives, this piece was personalized by using the clients’ own artifacts and memorabilia, as well as additional ingredients carefully selected from my morgue. Creating works with special meaning to those for which they were intended has always been some of the most fulfilling time I have spent as an artist. You are currently browsing the archives for the J Turrell category.